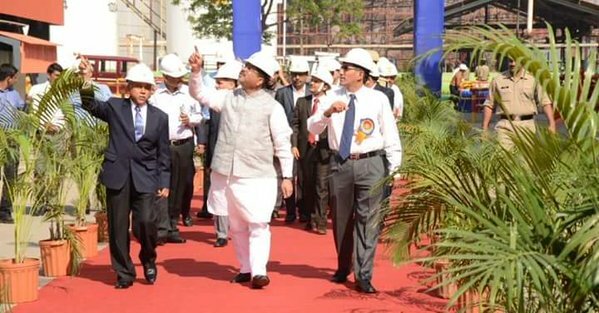 The new state of the art Crude Distillation Unit (CDU) of Bharat Petroleum’s Mumbai Refinery was dedicated to the nation today by Shri Devendra Fadnavis, Chief Minister of Maharashtra and Shri Dharmendra Pradhan, Minister of State (I/C) for Petroleum and Natural Gas at the Mumbai Refinery. The unit with a capacity of 6.0 MMTPA at a cost of Rs. 1419 Crores is a replacement of old Crude and Vacuum units of the refinery. Also present on the occasion were Members of Parliament Shri Arvind Sawant, Shri Rahul Shewale, Shri Gopal Shetty and MLA from Chembur, Shri Prakash Phaterpekar. This Refinery of BPCL was commissioned in 1955 by Burmah Shell Refineries Ltd. with a capacity of 2.2 MMTPA. Post-nationalization in 1976, the refinery has progressively expanded through low cost revamps and adoption of new technologies. Currently, it has an installed capacity of 12.0 MMTPA with three Crude & Vacuum Distillation units with matching secondary processing and treatment facilities. The commissioning of this new CDU would ensure cleaner environment and efficient use of energy with lower emissions and reduction in energy consumption. The Sulphur dioxide emission from this new unit would be less than 10.5 mt/d – the lowest in the country amongst all the refineries. Tightly heat integrated with furnaces of higher efficiency, the reduction in energy consumption in terms of Liquid Fuel Equivalent (LFE) is expected to be about 30 % which results into estimated savings of Rs. 128 Crores per annum on fuel consumption. The integral part of this new CDU is its superior design and safety features. This has resulted in significantly lesser number of equipments as compared to older units and facilitates better turnaround management during shutdown and routine maintenance. The unit is designed with the latest safety features like blast-proof control room and closed drainage system, thus making it an efficient, intrinsically safe and sustainable unit, with higher distillate yield of 3% and thus contributing to higher Refining margins. Looking ahead, the stabilization of this unit would help in dismantling the old 1955 CDU units, thereby creating space for refinery modernization to meet future auto fuel norms and other profitability enhancing projects. Speaking on the occasion the Minister Shri Pradhan announced the plan of setting up of a new refinery in Maharashtra. Chief Minister, Maharashtra assured to provide land and other facilities for the proposed new Refinery.